We are a leading Manufacturer of adjustable chamfering cutter from Chennai, India. 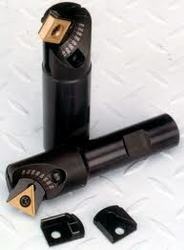 We are a paramount organization that is engaged in offering high quality Adjustable Chamfering Cutters. To manufacture the offered range, we make use of high quality material that is sourced from trusted and reliable vendors of market. These cutters are offered by us in variegated sizes and dimensions at industry leading rates. Looking for Adjustable Chamfering Cutter ?